William Quincy Belle: Say Cheese! Crash, bang, boom! Like everybody else, I caught my share of YouTube videos of the meteor falling over Russia on February 15, 2013. It was quite unusual and even spectacular in some clips. One fellow who was filming with a handheld camera was almost knocked over by the accompanying sonic boom and shock wave. A curiosity came out of the many video clips posted by amateurs or picked up by the media outlets. Why did so many Russians "just happen" to have a dashboard camera in their car filming at the precise moment of the meteor streaking by? It seems that the Russians are nuts about these cams. 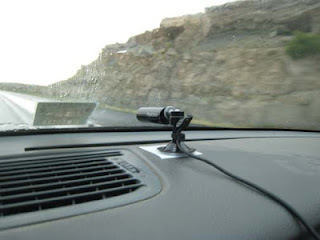 It wasn't a question of "just having" a cam, it would seem everybody has jumped on the bandwagon and bought one of these things to record their time behind the wheel for posterity. Strange? Russian courts apparently don't like verbal testimony but a video of what happened is a sure-fire way of pleading your case. And the cases? Holy cow! Fights will erupt over accidents. The guy in front of you will deliberately back up into you and claim it was your fault. People will fall onto your hood in front of a cop saying you hit them. The various incidents go on and on. People are filming everything out of self-protection. Yes they need proof for court or the insurance company but they also need to make the guy coming at them with a baseball bat know he's being recorded. This plethora of video has resulted in some hilarious compilations on YouTube of some truly insane traffic accidents. Are Russians absolute lunatics behind the wheel? Then again, I'm sure all of us in North America have our questionable moments but we'll have to wait for the dashboard craze to catch up here so we will have the video evidence. The following is but one example of the dozens of compilations of dashboard videos to be found on YouTube. I shake my head wondering what these people were thinking and sometimes I laugh out loud at the sheer lunacy of it all. On 15 February 2013, a bright meteor appeared in the skies over Russia at about 09:20 YEKT (03:20 UTC). Travelling at 18 km/sec (40,000 mph), it quickly became a brilliant fireball as it passed over the southern Ural region, exploding in an air burst over Chelyabinsk Oblast at about 15 to 25 km (9.3 to 16 mi) above the ground. The atmosphere absorbed most of the released energy, which was equivalent to nearly 500 kilotons of TNT (2.1 PJ), making it 20–30 times more powerful than either of the atomic bombs detonated at Hiroshima and Nagasaki. The International Astronomical Union (IAU) now designates the event as a "superbolide" event. About 1,500 people were injured, two seriously, including a woman flown to Moscow with a fractured spine. All of the injuries were due to indirect effects rather than the meteor itself, mainly by glass from windows shattered by a shock wave. Over 4,300 buildings in six cities across the region were damaged by the explosion. The meteor created a dazzling light, bright enough to cast moving shadows during the morning daylight in Chelyabinsk and was observed from Sverdlovsk, Tyumen, Orenburg Oblasts, the Republic of Bashkortostan, and in Kazakhstan. Eyewitnesses also felt intense heat from the fireball. With an initial estimated mass of 10,000 tonnes, the Chelyabinsk meteor is the biggest object to have entered the Earth's atmosphere since the 1908 Tunguska event, and the only meteor known to have resulted in a large number of injuries. The author explains why dashboard cameras are now common in Russia: Fights, bribe requests, scams, and an host of attempts to defraud both insurance companies and unsuspecting motorists. The courts don't like to deal with verbal testimony but a video tape is a sure-fire way of proving your case. ... This article is a must read. Driving in Russia seems like the Wild Wild West. It is Mad Max anarchy and seemingly dangerous as hell. Hair-raising car crashes and fistfights between drivers are just a sampling of the thousands of bizarre automobile incidents that have been inadvertently captured on video by Russian drivers and uploaded onto video-sharing websites. The videos are a quirky byproduct of what has rapidly become a major fad in Russia -- the use of dashboard-mounted video cameras. Motorists use these dash cams as a tool to help fight their corner against Russia's notoriously corrupt traffic police as well as against scammers trying to extort money out of drivers. On the other hand, this video is not funny; it is startling in its violence. The driver of an SUV loses control of his vehicle and crosses the highway into on-coming traffic and is broadsided by an 18 wheeler. Apparently this accident took place on February 24, 2012 near the village of Omutischi Petushki in Russia's Vladimir Region. Needless to say the driver of the SUV was killed. Needless to say, if you are in Russia and you wish to rent a car, make certain that you avail yourself of their local version of CDW coverage!